Are there magic tales in Africa at all? Even among authorities there are many pros and cons. This book wants to join the debate and claim: Yes, there are! The author, who brings in more than 45 years of attachment to African folklore and the insights gained by listening to hundreds of different story-tellers, approaches the subject from various aspects. In part I she offers 70 tales which she recorded in Namibia between 1975 and 1997. These texts, most of them examples of magic tales, have not been published before. They are addressed to any reader who enjoys reading folktales. 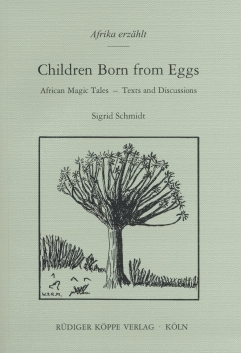 Part II gives the background information on the narrators and the individual tales, part III a general discussion of the character of African magic tales from the literary and folkloristic point of view. The study focusses on the traditions of the Nama-speaking peoples but they are always seen in relation to further African lore, particularly to their Bushmen (San) and Bantu-speaking neighbours. Special emphasis is laid on a comparison with European Zaubermärchen. Part IV adds the tools for a closer study: motif analysis of all existing variants of this group of tales, motif index according to Stith Thompson and subject index. The author wants to help African readers to appreciate fully their local heritage but also to see it in relation to further African and international traditions, and to help Western readers to understand and appreciate African lore. Clearly, the author has commanding knowledge of both the texts (language) of the tales themselves as well as the sociocultural and the physical contexts within which they are narrated. Schmidt hat im Rahmen ihrer Erzähldaten und der vergleichenden Lektüre ein Maximum an Information dokumentiert und analytisch durchdrungen. Bestechend ist die Präzision der Datendarstellung und gute Lesbarkeit ihrer Ausführungen. Die Abhandlung ist als folkloristisches Meisterwerk anzusehen, das eine Schwelle aufzeigt, jenseits der die weitere Erzählforschung in dieser Richtung nur mehr als Teamarbeit vorstellbar wird. Dieses insgesamt mehr als 500 Seiten umfassende Buch ist wissenschaftlich zweifellos ein beeindruckendes Werk, das für alle Erzählforscher eine wahre Fundgrube sein wird. [...] Verlegerisch in bewährter Weise vom Köppe Verlag betreut ist das Buch auch im Hinblick auf Satz und Layout handwerklich gut gemacht. Ziel der Autorin ist es, nicht nur einen Beitrag zur wissenschaftlichen Erforschung afrikanischen Erzählgutes zu leisten, sondern zugleich zum Erhalt des kulturellen Erbes Afrikas beizutragen. Das dürfte ihr gelungen sein, und auch die an solchen Geschichten stets interessierten namibischen Khoekhoen werden ihre Arbeit sehr zu schätzen wissen.